Introduction KPZ Erasmus policy at KPZ International students International exchange programme Preparation study in Zwolle International staff & projects Contact How to apply? KPZ is an independent university of applied science, teacher training college, that focusses on: students becoming excellent primary school teachers; practice-based study; providing valuable educational development.We have more than 800 students and about 110 employees. Students appreciate the KPZ for several years as one of the best teacher training colleges and best small university in the Netherlands. KPZ is personal, exceptional, developing and connecting. It is exceptional because of its willingness to think out of the box which sometimes means we deviate from mainstream ideas. KPZ has a unique educational concept which aims to develop the professional teacher with outstanding outcomes. KPZ provides a fertile learning environment and creates a strong community spirit. We offer sincere personal attention, personal development and cooperation, an open and inquisitive attitude and are striving after quality. KPZ is a Catholic college with an open identity where everyone is welcome. The European Commission has awarded the charter 2014-2020 to Katholieke Pabo Zwolle. Educational institutions constantly struggle with the question which targets and issues to prioritize. Should emphasis be put on cognition or talent, on theory or practice, on result or development? KPZ does not want to make over-simplified choices, but deal with apparent opposites in a nuanced considered manner. For example between focusing on the development of the child on the one hand and realizing the necessary social output on the other. KPZ takes a permanent interaction between opposing forces into consideration. It tries to find a balance between doing the right thing and doing things right, between tradition and reform, internal and external factors and between process and result. This balance, the connection between seemingly opposing values can be observed everywhere in KPZ’s culture, in its educational supply and its activities. Thanks to its small scale the strength of KPZ lies in its focus on people. The personal contact between students and lecturers is deemed very important by KPZ. An open attitude where people dare to be critical and are not afraid to make mistakes is according to us a precondition for learning from each other and this can only thrive in an environment where people collaborate on the basis of trust. Thinking in terms of connection and balance is strongly expressed in the warm and at the same time challenging environment offered to the students. An environment in which security, trust and challenge co-exist. KPZ is a strong and close learning community in which respect, cooperation, honesty, meeting each other and the catholic values are central. From its social responsibility and an open catholic identity KPZ stimulates students from whatever background to undertake their own development. KPZ gives students every opportunity for personal development; as a human being and as a teacher with backbone, guts and a strong professional identity; with experience of life filled with educational skills, socio-cultural awareness and a proper moral compass. An ambiance that stimulates and invites you to develop yourself, is partly defined by the physical environment but mainly created by human being. Staff members have an important role in this. From them enthusiasm, attention and dedication is expected to support the students in their environment. For KPZ co-operating and connecting with the field is invaluable. Co-operation after all leads to new knowledge and insight, to inspiration and initiatives which can lead to educational improvements and not in the least to excellent possibilities for young ambitious students to let their professional identity reach full maturity. The KPZ has signed the Code of Conduct and is an international recognized and accredited university of applied sciences. In the Erasmus Policy statement you can read more about the strategic policy of Katholieke Pabo Zwolle regarding internationalization. The European Commission has awarded the charter 2014-2020 to Katholieke Pabo Zwolle. Erasmus+ is the current European programme for international initiatives in higher education. To be able to join the opportunities offered by Erasmus, KPZ has submitted the Erasmus Policy Statement, which gives an overview of the international strategy. The Education, Audiovisual & Culture Executive Agency has approved the statement, and KPZ received the Extended Erasmus University Charter (EUCX), which gives access to all Erasmus-activities. The Erasmus Plus Programme is the European Programme for international mobility and contacts in education and training opportunities for all. The programme runs from 2014 until 2021. It enables people at all stages of their lives to take part in stimulating learning experiences, as well as helping to develop the education and training sector across Europe. Look at the overview of the approximately 36 European Partner Institutes of Hogeschool Katholieke Pabo Zwolle, Erasmus parters and partners in Switzerland to check whether your university is partner or KPZ. In the teacher training college’s various courses and training the development of the professional identity is central. Crucial thereby are the domains ‘Having an eye for a child’, ‘research, design and development’ and ‘professional skills’ which are offered in seven learning lines/trajectories. Learning trajectories are among other things based on ‘reflection and research’ and ‘giving meaning, ethics and aesthetics’, but also on the generic basic knowledge and the primary school subjects. KPZ also makes clear choices within the study programme and looks for connection and balance. This finds among other things expression in the course programme. The international exchange study programme Teacher Training Primary Education must prepare teachers for their role in a globalised society. The impact of globalization on education is enormous. The teacher plays an important role in spreading knowledge concerning culture, languages, cultural heritage and European citizenship. In this perspective KPZ offers an international programme of 30 ECTS for students from our partner institutes within the EU (spring semester). All courses are in English (level B2) and focusses on reform pedagogics, Dutch culture and society, teaching practice and internationaL primary curriculum. All student-teachers in the second half of their studies are welcome. Students from countries within the European Union (EU) are normally sent by our Erasmus partners and follow the rules of the Erasmus+ Program. Students from outside the EU should first contact the International Office about the procedure by emailing Harrie Poulssen, the international officer. E-mail: h.poulssen@kpz.nl. Teaching Practice is a very important part of the KPZ training program. More than 100 primary schools in the region supervise the students during their practical training. There is a variety of educational systems ranging from denominational and non-denominational to special schools founded on reform pedagogy, such as Basic Development (Basisontwikkeling) Montessori, Freinet, Dalton and Jenaplan schools. Erasmus+ offers students the chance to study, train and undertake work experience abroad. Exchange students are admitted through the exchange programmes and inter-institutional agreements between KPZ and an international partner institution. Exchange students are selected by their home university. KPZ has about 40 European partner institutions in 18 European countries. If you are student at one of our partner universities you are very welcome to participate in our international exchange programme. Read more..
Katholieke Pabo Zwolle has approximately 36 European partnerships with institutes for higher education. Within the framework of the Erasmus + programme of the European Commission international mobility is encouraged between European Educational Institutes. Teachers and staff have the possibility to do a work exchange visit with colleagues abroad. It is possible to participate in an international week, to (job)shadow a foreign colleague, do guest lectures or arrange an excursion week at a partner institute. The colleagues from our partner institutes are also welcome to Katholieke Pabo Zwolle for the same activities. In recent years, every April or May, the international student conference Teacher in Europe Primary Education is hosted by Katholieke Pabo Zwolle and VIAA (former Gereformeerde Hogeschool). The conference is about internationalization and how students can best shape internationalization in their future jobs as teachers. Organisers of the studentconference are the Centre for the Internationalization of Dutch Education (CILO) and the two hosts. The theme of the three-day conference in 2015 was: ‘Empowering values and norms in European Education’. At the conference students based the international school projects they designed on different aspects of the theme. What they learned in these three days was the following: ‘What is internationalization at an elementary school’; ‘What are appropriate projects’; ‘How to write a project plan’; ‘How do you find a partner school abroad’ and ‘How do you apply for a grant’. 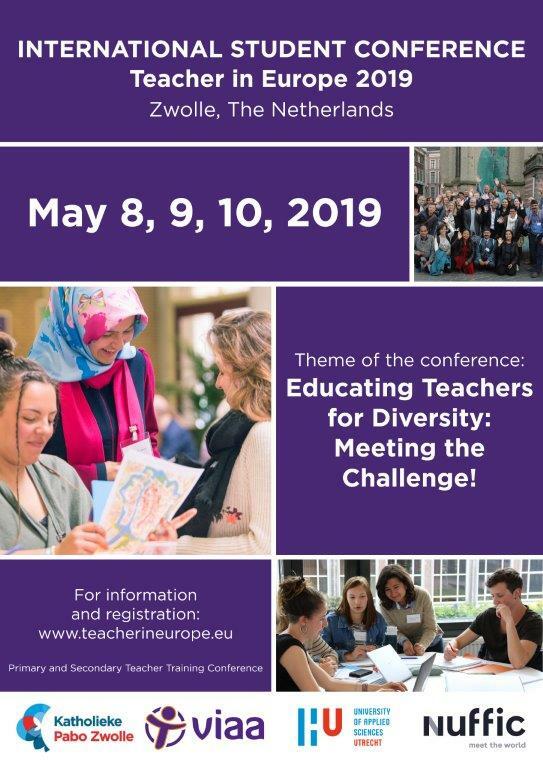 Become inspired and meet international students, teachers, and coaches at the Teacher in Europe Student Conference in Zwolle, the Netherlands, on 8, 9 & 10 May 2019 (TIE 2019). As well as in 2018, our successful international conference will be aimed at students from teacher trainer colleges for both primary and secondary education. Theme of the conference will be: ‘Educating teachers for diversity: meeting the challenge!’ As a (future) teacher, you have the opportunity to teach students how to deal with both the difficulties and opportunities of diversity. The focus during the Teacher in Europe Student Conference TIE2018, will be on how to successfully deal with diversity in the classroom, in both primary and secondary education. The teacher training department ‘Katholieke Pabo Zwolle’ has an International Office to support international exchange of students and staff for incoming and outgoing mobility. If you are interested in the KPZ international exchange program for Erasmus students, look for the information about the International class in Spring semester (5 months) each year. The KPZ is easily accessible from the NS railway station in Zwolle by public transport or on foot (a 10 minute walk). At the front of the station you can take the city buses or one of the regional buses. Bus stop: Wethouder Alferinkweg (bus stop closest to our building). The exchange programme Spring semester 2020 (academic year 2019-2020) will run in the period from 27th of January until the 27th of June 2020. Please apply by submitting the application form. Deadline for application is: 1 November 2019.